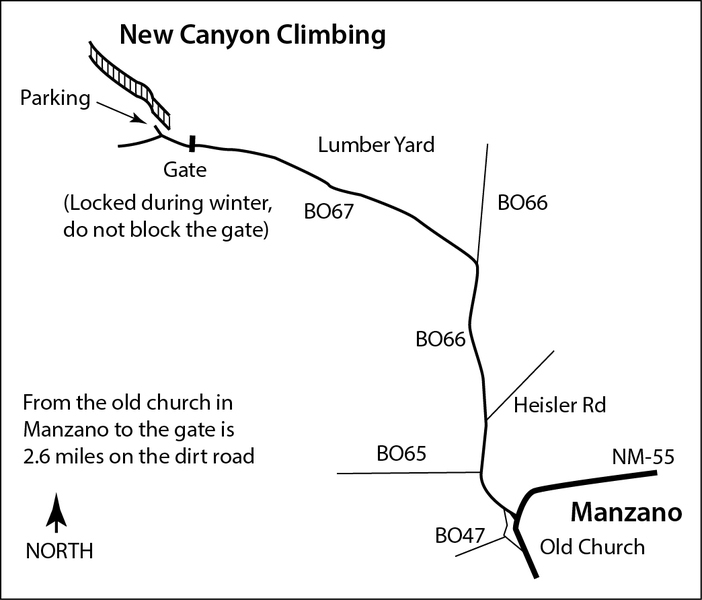 New Canyon is a small, little-known, limestone climbing area tucked away near the town of Manzano. Generally, the climbs are vertical to slighty less than vertical and are short, 40 to 50 feet high. The style of climbing is typically incut crimps and pockets and involves powerful moves. Most of the climbs involve one or two boulder problems with good rests between. New Canyon is climbable year round, but sweltering hot during the summer and cold on anything but the warmest winter days. In the summer, climbing early in the morning, before the sun hits the wall around noon, can be comfortable. New Canyon has about 40 bolted sport routes with another 20 trad or top-rope routes. The early years of climbing at New Canyon got off to a rough start. Many of the sport routes were chopped or had the hardware stolen shortly after being established. In addition, several routes did not have anchors and required rappelling from a tree or downclimbing. Recently, in 2016 and 2017, anchors were placed where needed and all of the outdated "leaper" and "teardrop" hangers were replaced. Also, most of the chopped routes have been re-bolted and include top anchors. Currently, all of the sport routes at New Canyon have modern-style anchors with chains and some have lowering steel biners. If you haven't been to New Canyon in a while, it's definitely vastly improved and worth another visit. NOTE: Please use either the South access trail, close to the parking area, or the middle access trail (with steps made of rock and boards, about 30 paces upstream) to prevent erosion. The gate which is 0.2 miles before you reach the climbing area is often locked in the winter months. If the gate is locked, park away from the gate on the side of the road and walk in. Do not block the gate. Turn west at the church in Manzano and stay right on this paved road. Be sure to stay right at the yellow house and continue on the maintained dirt road. The USFS sign is two plus miles beyond the yellow house. The cliffs are indeed 50 yards up and right of the sign. If you can't find Manzano it is easy to Google directions to it. There are very obvious signs in Manzano for New Canyon. Turn right by the church (where the sign says to go), then follow the well kept dirt road a few miles (3 or so) and park literally right next to the Cibola National Forest sign in a little pull out on the right. The Mighty Wall is pretty much directly over the pull out on the right side of the creek bed and you can just follow the wall all the way down. This guide can be found at REI or Stone Age. A Lil 5.7+ we just put up!! Girlfriend (5.10b) 3 bolts to 2 chains. I would love to help fix it up, my Mother in-law lives just 25 mins away from New Canyon. I checked it out on 27 May and was glad to see the fire did not reach the crag. (It did come very close) . Not only do I think this a nice little crag to train my daughter but it would give me a reason to get out of the house, LOL. Anyone willing to help please let me know. I will need to know what size/type hangers to get. plus name of the P.O.S. would took them so I can charge him. Please do tell the name he should be "black balled". I can't believe a true climber would ever do such a thing. The road to the crag is open. Turn west at the church in Manzano and stay right on this paved road. Be sure to stay right at the yellow house and continue on the maintained dirt road. The USFS sign is two plus miles beyond the yellow house. The cliffs are indeed 50 yards up and right of the sign. Route quality is hit or miss here. Sometimes I wonder what the person who bolted this place was thinking. Oddly placed bolts, and routes that could have gone further abound. Watch out for routes without anchors - what a PITA! Wall names/descriptions, route descriptions and locations are all screwed up. The only ones that make sense are the ones with photos. To add to the directions mentioned above, there are very obvious signs in Manzano for New Canyon. Turn right by the church (where the sign says to go), then follow the well kept dirt road a few miles (3 or so) and park literally right next to the Cibola National Forest sign in a little pull out on the right. The Mighty Wall is pretty much directly over the pull out on the right side of the creek bed and you can just follow the wall all the way down. Currently, ALL OF THE SPORT ROUTES HAVE ANCHORS NOW, NO MORE MISSING BOLTS OR ANCHORS. Several routes even have lowering steel biners as well. Also, all of the old leaper-syle and teardrop hangers have been replaced with Fixe and Metolious stainless hangers. Please don't gank my hardware, man.